She may contest the Lok Sabha elections from her mother Sonia Gandhi’s constituency, Raebareli, Congress sources have said. “I have not sent Priyanka and Jyotiraditya for just two months. I have sent them to take the Congress’ ideology forward in Uttar Pradesh,” Rahul Gandhi told reporters. Sources say her appointment to a key position reflects the Congress’s realisation that in a politically vital state like Uttar Pradesh, which has 80 parliamentary seats and is considered the route to power at the centre, the party needs to up its game and cannot afford just one in-charge. It is a huge gamble for the Congress, a sign that the party is all for aggressively taking on PM Modi and the BJP in the coming election. Rahul Gandhi commented that the BJP was “panicking” and that the appointments were part of the Congress’ efforts to defeat the Bharatiya Janata Party. “We have no enmity with [Bahujan Samaj Party chief] Mayawati ji and [Samajwadi Party chief] Akhilesh ji, who have formed a coalition in the state,” Rahul Gandhi said. “I respect them. We are ready to cooperate with them wherever possible. Ultimately the aim is to defeat the BJP.”Congress leaders say Priyanka Gandhi’s arrival in party politics will galvanise the ranks that have been demoralised by the Mayawati-Akhilesh Yadav move to form an alliance in UP for the national election without the Congress, which has been pitching for a grand opposition alliance to take on the BJP. 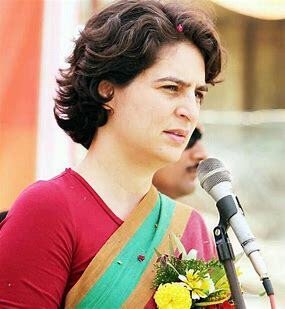 Priyanka Gandhi is in New York and is expected to return on February 1. Be the first to comment on "Priyanka Gandhi formally joined National politics ahead of 2019 elections"